I’ve kept pretty busy today, feeling great now that I have bounced back from the terrible bout of self-inflicted dehydration. Got up, got Emma off to school, then made my breakfast. I found the recipe on Pinterest through a friend and was intrigued. I would definitely make it again. 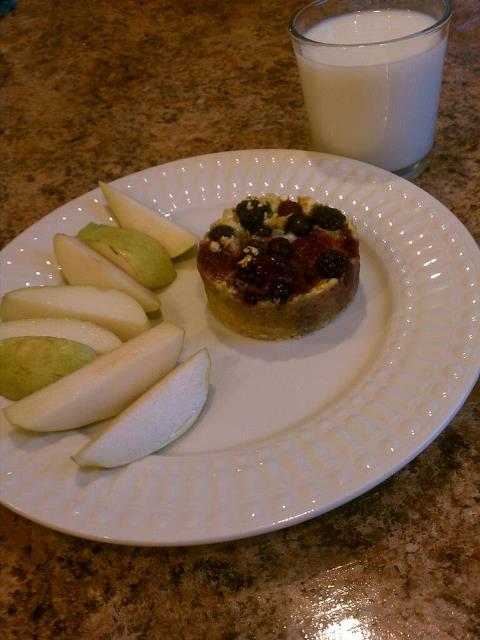 It is called a 1 Minute Clean Berrylicious Microwave Minute Muffin, I made some changes so here is the recipe. 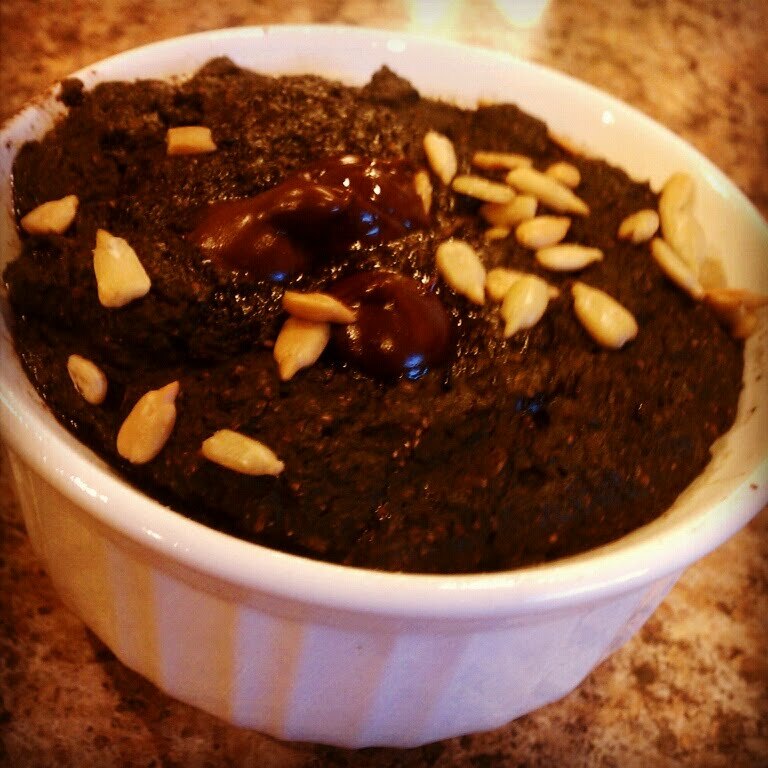 Also here is the link to the original recipe. Click for recipe. Mix oats, egg, agave and milk together in a coffee cup or a ramekin (I used a ramekin), then put berries on top and press into mixture slightly. Put it in the microwave for 1 minute, check it then see that it isn’t done and microwave for another minute. 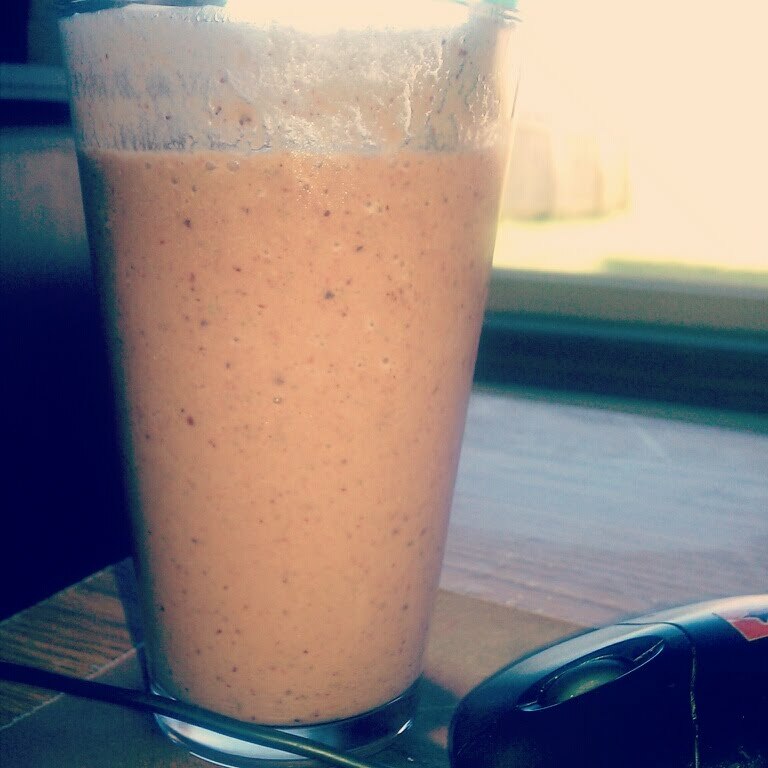 I think it may have taken longer because I used frozen berries in place of using fresh. I served it with a sliced Bartlett pear and 8 oz of FF milk. It was very filling and quite tasty! After breakfast I got two miles done on the treadmill, I was able to up my jogging and running speed by 1 MPH so I was happy. My inhaler was not even needed. Maybe all this clean eating is resolving my exercise induced asthma issues. I know the asthma was not from being out of shape because I was diagnosed with it as a child. Maybe it was all the chemicals and altered foods? Who knows, I’m not a scientist or a doctor. 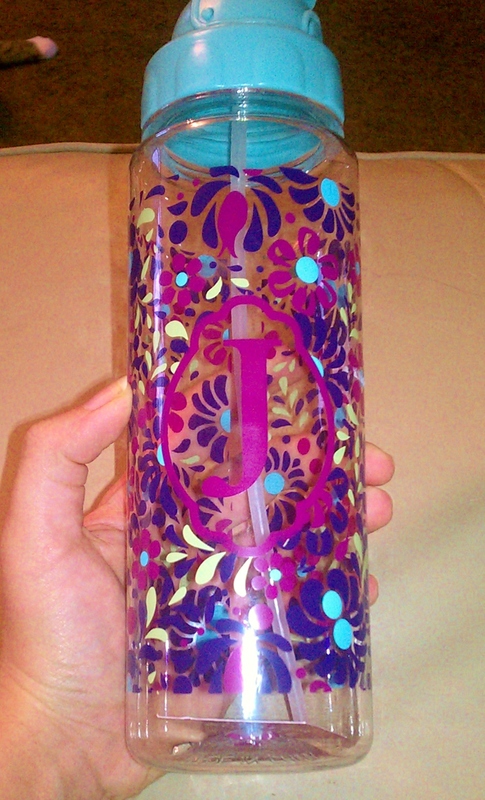 anyhow, it was a great run and I got to enjoy my new water bottle that my friend Heather brought me the other day. It is so cute! I also realized I need a new set of ear buds, I was getting tired of them popping out mid run and distracting me. So annoying. almost as annoying as the dog pouting any time I get on the treadmill. he hates the thing and doesn’t like people to use it. he stares and pouts and comes up and sniffs you to see if you are okay and it is a distraction. He’s a dog though and doesn’t get it so I forgive him. 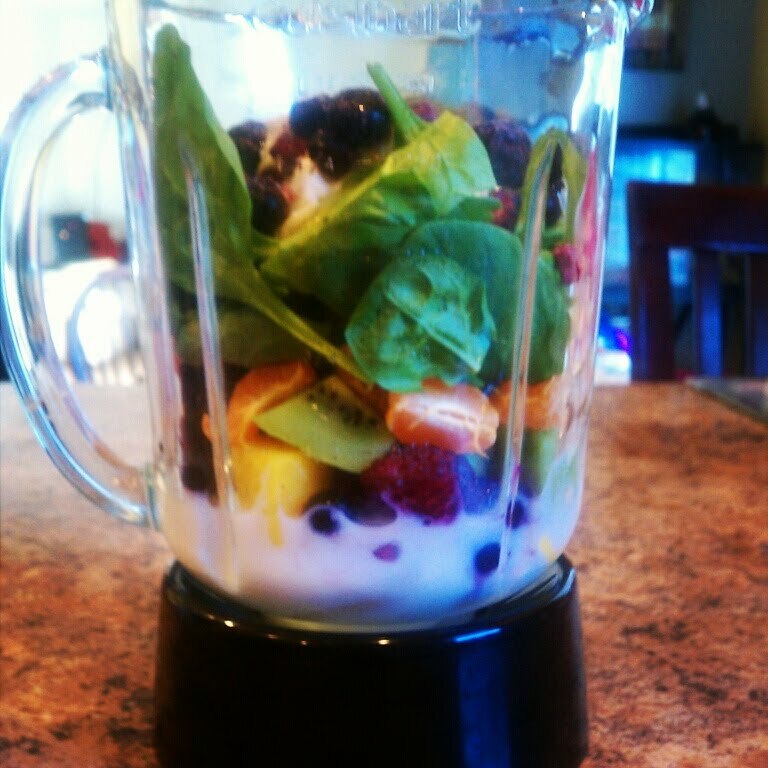 Lets see after my run I started dinner. I had left over black beans and ground turkey from last nights black bean burritos so I threw it in the crock pot with a ton of veggies and spices and it is now chili! perfect dinner for tonight. It is chilly and rainy out and Emma has a game to play tonight. May as well put something warm, hearty and healthy in us first. It smells wonderful and I can’t wait until dinner time. All of my errands were run after that, I enjoy being out running though. Got new rugs for the camper, a new bat and bat bag for Emma. They are both pink of course! I also solved the pesky ear bud issues and got some sport ones. I can’t wait to try them out in the morning tomorrow! Now I need to get my Pump for the day done, have dinner and get the kiddo off to her muddy baseball game. Posted in BeachBody, Cooking, Dieting, Exercise, Family, Fitness, Food, Health and Fitness, Les Mills Pump, Life, lifestyle, recipes, Running, Uncategorized and tagged baseball, Beachbody, body pump, breakfast, diet, Dieting, exercise, exercise induced asthma, fitness, food, health, healthy, healthy-living, kids, les mills, les mills pump, life, microwave, oatmeal, shopping, water bottle, weight, weight loss, work out, Workout. Bookmark the permalink. for breakfast! so today I tried something new for breakfast so I figured I would share while these kids are happy, quiet and occupied. They were pretty wound up for the funeral showing and dinner after this afternoon and evening. Boredom affects a 5 and 6 year old like 20 Redbulls would a full grown adult. So I brought mine plus one other back to my house for part of the late showing for board games to wind them down before we head back. 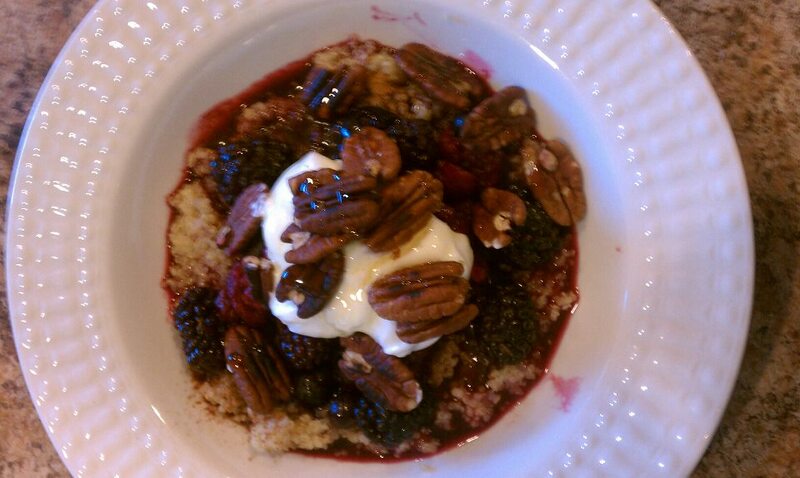 So for breakfast I made Quinoa with berries and pecans. It was amazing and I think I may eat it daily. In a saucepan combine quinoa, milk and water, bring to a boil then cover and simmer for 15 minutes or until liquid is absorbed. While quinoa is cooking toast pecans in a dry skillet for 2 to 5 minutes, set aside. Put berries in a microwave safe dish and microwave for 2 to 3 minutes until the berries start to soften and break down a little, set aside. When quinoa is done fluff and put in bowl, top with cinnamon, then fruit, then yogurt then pecans and last drizzle the agave on top and enjoy. 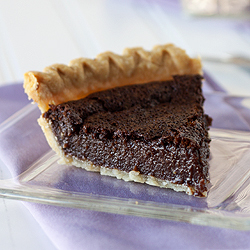 I found a similar recipe here and adapted it to my own tastes and needs as I listed above. 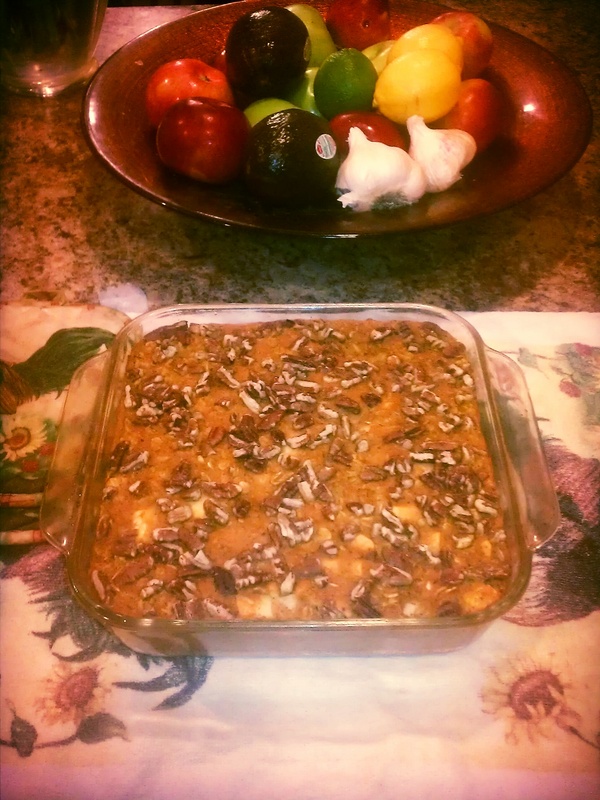 Posted in Cooking, Dieting, Food, lifestyle, recipes, Uncategorized, Well-being and tagged berries, breakfast, children, cinnamon, cooking, funeral, health, healthy, kids, pecans, quinoa, recipe, showing, yummy. Bookmark the permalink. We had a very productive trip to the grocery store(s) yesterday. Have everything we need minus one thing, just have to make a trip to the butcher shop this week for some chicken breast. Got some great stuff, and trying some new things. 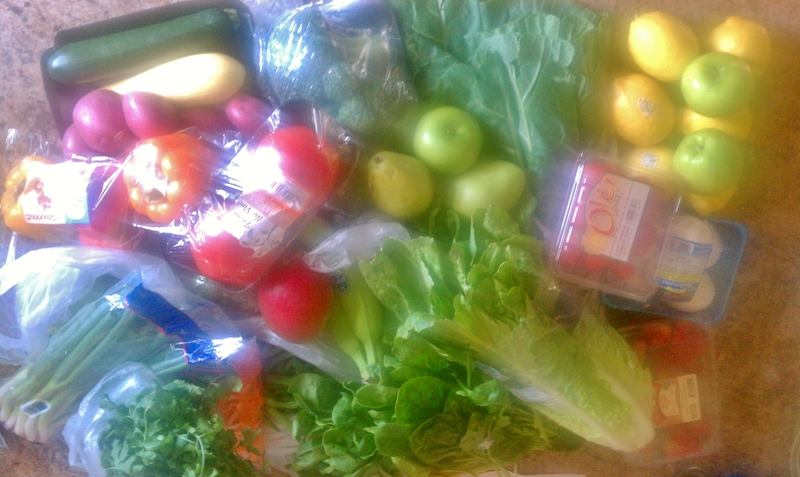 A weeks worth of produce for a family of 3 humans and one bearded dragon. Totally new to me food: Gnocchi. Found some whole wheat gnocchi and figured why not give it a go. I loved the texture of it. 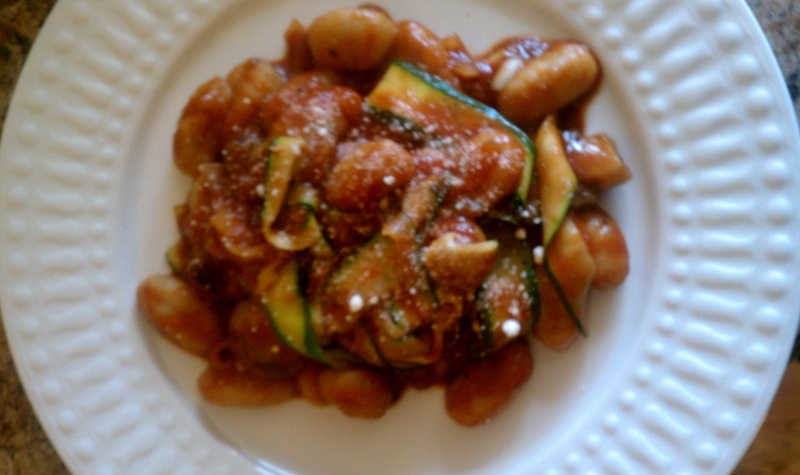 Gnocchi with mushroom, onion, zucchini ribbons in a homemade tomato sauce. Lastnight's dinner. This is not a new to me food. I have had horseradish before but this is the first time I did not buy it in a jar. 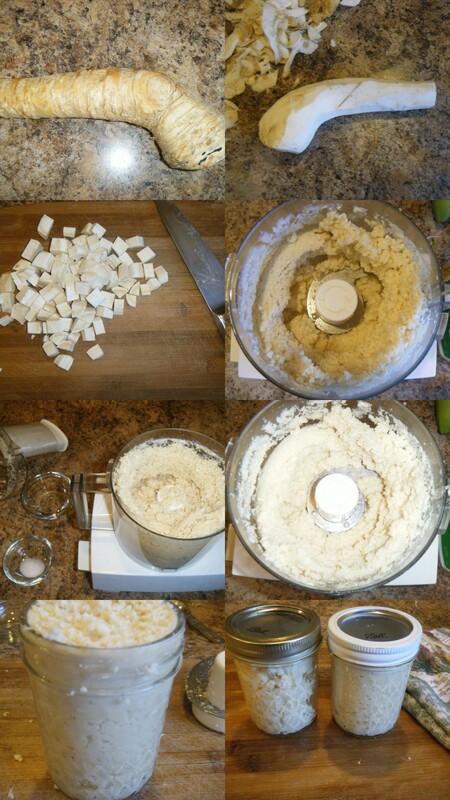 This morning I made my own ground prepared horseradish. It was super simple. Watch out though it is harder on the eyes than onions! and last but not least I also bought the stuff to make Chocolate Chip Quinoa Trail Mix Balls. I found the recipe on Pinterest. 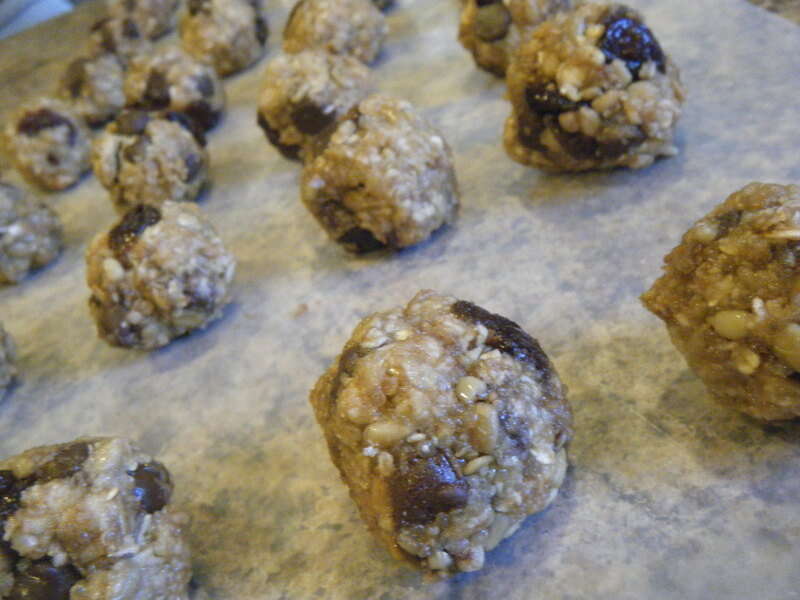 Here is a link to the recipe – http://www.eatliverun.com/chocolate-chip-quinoa-trail-mix-balls/. BTW they are soooooo freaking good! Now onto finishing up dinner and then Zumba time! Posted in Cooking, Dieting, Family, Food, Health and Fitness, lifestyle, recipes, Uncategorized, Well-being and tagged bearded dragon, cooking, diet, Dieting, dinner, food, gnocchi, health, healthy, healthy-living, homemade tomato sauce, horseradish, life, quinoa, shopping, Veggies, whole wheat, yum yum, Zumba. Bookmark the permalink. Week 7 Check in and Bonus Recipes. First of all thanks for the shout outs maranack http://marianck.wordpress.com/ and lose it bighttp://loseitbig.wordpress.com/ . My wordpress/blogger support group is the best! Check out their pages when you get a change. Good reads ya’ll. Oh joy, it is once again Tuesday so I once again am required by some law in my own head that I should babble on about random topics and then tell the world what I weigh and how many inches I measure. But I don’t mind. It has now become more of a habit than a chore for the most part. So what shall I babble on about today? I think I will start with the status of The Color Run (my first 5k) I went on at the assigned time to register to find out they moved the registry two more weeks away. Meh, I was slightly peeved for a second then realized it was a silly thing to be bothered by. Then later I found that they moved the date and there is a HUGE difference. That would cut off 5 plus weeks for me to get used to the running distances thing. So I better get on it. And given the date half of my team has to drop out. That gives me a huge sad face. With it being in the midst of wedding season I have a wedding to attend as well as a Bridal shower to which I am the Matron of Honor both the day before the 5k. Still figuring out how I am going to pull off doing both then running. But I am sure I can figure it out. I always do. It’s one of those things us moms are good at. Spreading ourselves super thin and needed to be two places at once and end the day basking in the awesomeness of success! I am still doing the 5k; it may be more inconvenient, but hell. I said I was going to do it so there is no turning back. 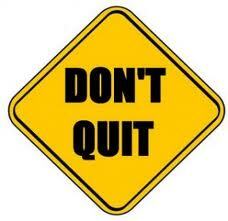 I can’t fathom being a quitter before I even start. That kind of attitude will put me back in those size 20’s I wore last year. I thought that I started Pump Extreme yesterday but it was actually a walking day so I did 35 minutes of step aerobics, walked for 10 and did about 10 minutes worth of abs on the stability ball. I love that thing! So today is Pump Extreme for real. I am excited to see how it is. Every time I move up to a harder workout I really have to push to make it through but I always make it. Sometimes i cry while working out because it is hard, and it hurts and I am in terrible shape (but working on it). I say those tears are just me shedding extra water weight so bring it on. I am so glad Les Mills Pump is now available for the home. It was just what I needed to get started on sculpting the new and improved me. You like that? I so distracted you so you wouldn’t notice I was going to change subjects on a whim. Now let’s move onto one of the most important things in the world. Food! I have a habit of cooking food and then posting pictures of it on my facebook. 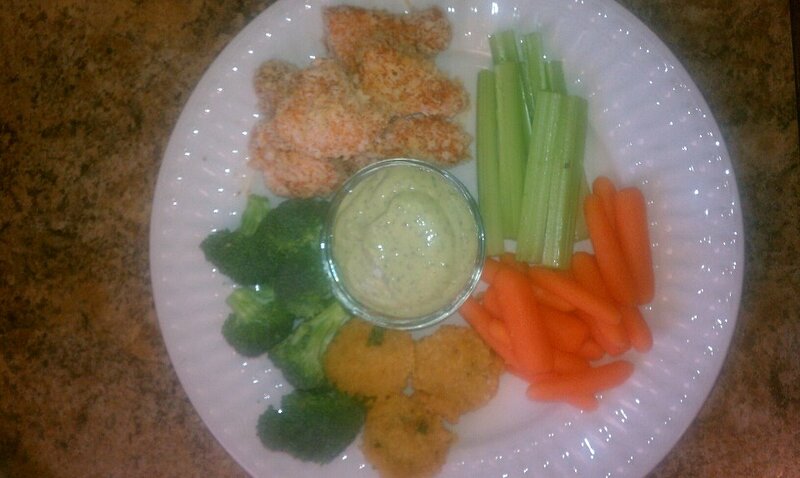 Last night I made Mock Chicken wings, Cheesy Quinoa Bites, Avocado Ranch and Crudités or people who don’t want to sound all fancy schmancy, cut up vegetables. I was asked for the recipes so I was thinking what better place is there to put them other than my blog? Preheat oven to 400 F. Mix all dry ingredients minus Panko in a bag. Coat chicken strips in mixture. Put Franks in a bowl and coat floured chicken. Put Panko bread crumbs in a bag and coat chicken. Bake for 25 minutes. Preheat oven to 400 degrees. Mix everything together and put into greased mini muffin tin, it took about a tbsp each. Bake for 10 to 15 minutes. Put everything into a food processor and run until smooth, if dip is too thick add more milk until it is the right texture for you. And if you cannot figure out how to make Crudités you take some veggies and cut them with a knife into pieces and serve raw. So that was my dinner last night. And, if I must say so myself it was pretty darn tasty! It really helped squash my chicken wing craving. I reheated leftovers and we ate the mock wings and quinoa bites for lunch, both reheated wonderfully. I think I will make a huge batch of both and wrap up small portion for a quick “frozen’ snack to reheat when I don’t feel much like cooking. Now onto what you all come here for on Tuesdays… the results are in! So I am down a total of 2 inches and 1 pound this week, now I am getting closer and closer to my 90 days. I am excited to see what the overall totals will be! On to week 9! Now I better get moving my cat has been staring a hole through my head for the past half hour. I think she is ready for some kibble. I did hear once before that you should feed your pets. Guess I will give it a go. Posted in BeachBody, Cooking, Dieting, Exercise, Fitness, Food, Health and Fitness, Les Mills Pump, lifestyle, recipes, Running, Uncategorized, Well-being and tagged aerobics, avocado, Beachbody, bloggers, body pump, buffalo wings, cheese, cooking, diet, Dieting, dinner, dip, dressing, excercise, exercise, fat, fitness, food, funny, goals, grand total, health, healthy, healthy-living, inches, Laugh, les mills, les mills pump, life, matron of honor, measurments, mock wings, pain, pounds, progress, quinoa, recipe, results, Scale, shout outs, stability ball, step aerobics, thank you, Veggies, walking, walking day, wedding season, weigh in, weight, weight loss, weights, whining, wordpress, work out, Workout. Bookmark the permalink.